Meeting Slipknot in San Diego. Not really. I am the Director of Social Services for a major charity and have an office in downtown San Diego that serves the nation’s third largest homeless population. I have an open door policy and all of the hard cases are referred to me by other agencies. I maintain one of the largest caseloads in San Diego County and depend upon a small staff of volunteers. I assist an average of one person every 5 minutes. I provide too many services to list but some examples include counseling, housing referrals, free prescription eyeglasses, food, employment training, clothing, and blankets. I deal with everyone from the chronically homeless to veterans on pension who can’t make ends meet. Woman (elderly voice): Hi, I have called every agency in San Diego looking for help… my daughter is trapped in San Diego. I live in Pennsylvania and she is stranded on the streets until Saturday. Me: Is she mentally ill or a substance abuser? Could you please elaborate on how she arrived here then became homeless? Me: You can be homeless and a good person, I believe that many people are homeless because they are too kind and don’t understand how to survive within a predatory economic system. Me: It’s ok, m’am. I will do whatever I can to help if at all possible. Woman: Oh thank you, thank you. You’re wonderful. Me: Go ahead, tell me what happened. Woman: Well, someone convinced her that she won a vacation to tour with Slipknot and she flew out to meet the band. Woman: Yeah, it wasn’t real. They said everything would be paid for. She really believed ::sobbing:: that she was going to live the rock star lifestyle! People are so cruel. She asked her 4 children if they minded if she spent her income tax return to buy a round-trip ticket to San Diego and they agreed. They said, “Yes, mom, go follow your dream!” When she arrived and went to Slipknot’s address, the occupants had no idea what she was talking about. She is stuck there until she flies home on Saturday. Me: Oh, I am so sorry she got tamed by a Slipknot hoax. That is so upsetting and tragic. Me: Okay, well I can try to get her into a women’s shelter. Does she need food? I had to meet this victim to complete my day. Me: I can give her a bag of groceries if you send her to my office. Woman: Oh, God bless you! You are an angel! I will send her right over. Her daughter walked into my office an hour later and she looked about 60 despite being my age. She had a lot of teeth missing from obvious crystal meth abuse. Me: Oh, hi honey. Are you the one whose mother called? I am so sorry you got tricked. Woman: I did something really stupid, I feel so dumb. Me (in radio announcer voice): Well don’t worry, I am not from the government and I am here to help. I gave her a bag of groceries and successfully got her into a women’s shelter after making a few phone calls. We heard about your trip out here and we’re so sorry about what happened. Please accept our gift as a taste of the amazing MTV lifestyle. 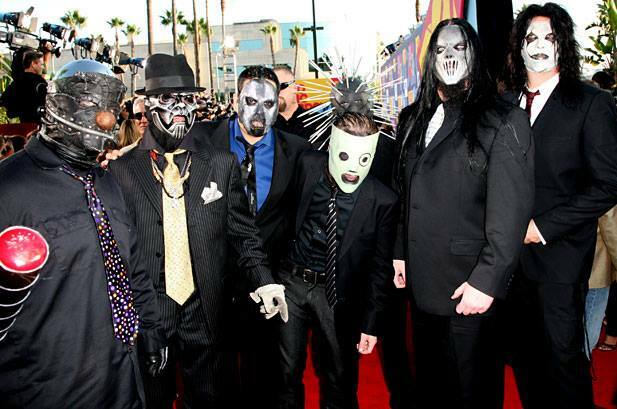 Slipknot, at Hollywood, Los Angeles, California.